With so much going on over a total of 3 days, plus set up on Thursday, it would be impossible to relate details of everything that went on at Silverstone Classic, so this is a glimpse of Silverstone Classic through the eyes of Letitia Mace. 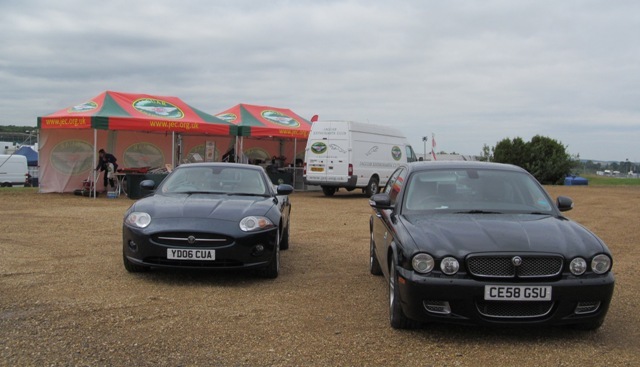 Rob Jenner and I arrived at lunchtime on Thursday, having already collected the JEC raffle car in Kenilworth and driven it in convoy with our black X358 XJR in torrential rain to Silverstone Circuit, where we met up with James Blackwell, Jennie Blackwell and Helen Hodgson. The three aforementioned JEC staff members had already set up the gazebo, so we helped unload the van and set up the stock etc. The worst of the rain had passed, but it continued to drizzle and wellingtons were the order of the day, so we dreaded a repeat of the rain storms of last year! Having finished setting up, Rob and I checked into our hotel and then went off to buy a Maserati and have dinner with multi talented Jaguar Specialist, David Marks, who advised on and whole-heartedly backed the purchase of the Maserati! 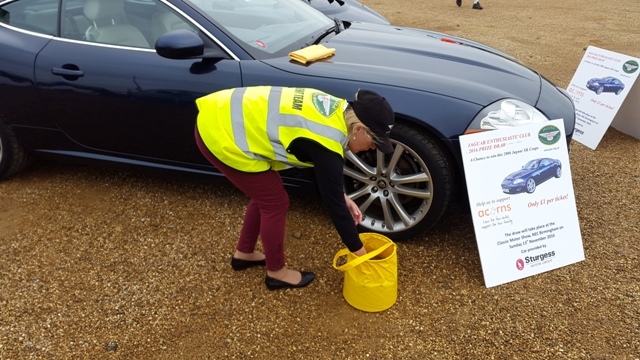 Arriving early on Friday morning, I prepped the JEC raffle car ready for display on the JEC stand, while Rob marshalled members into our area which was on the banking at Copse. This became our routine for the three days of the event, the marshalling aided by JEC volunteers Bob Welton and Keith Hurlock on Saturday, which was by far the busiest day of the three! I have never seen such an amazing array of the lesser known Jaguars! Over the 3 days we had three Project Seven’s, three XJ220’s, a Silk Cut replica, two C-type replicas and a D-type replica, all of which Rob picked out on arrival and ushered to the front of the stand where they naturally drew crowds of enthusiasts! One other car that stood out for me was a genuine 4000 mile from new 1990 4.0 XJ40 XJ6 in Signal Red. This absolute stunner is in truly immaculate condition, with one former owner. The pictures speak for themselves and more information can be obtained by request. It was purchased from Taggarts in Glasgow and stashed away unused, so everything was original, including fluids etc, until recently purchased by its current owner, having then covered a mere 3,500 miles. It has now been fully serviced, but the original tyres have been retained for the time being. Former Jaguar Technician, Rory Mackinlay remembers this car from when he was employed by Taggarts of Glasgow, but had no idea that it still existed in its current state! Is this the very best XJ40 in existence? 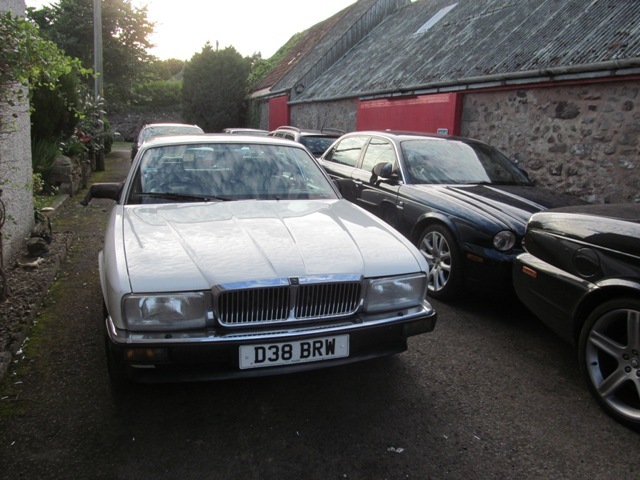 Sadly, despite my best efforts, I could not persuade the owner to bring it to Dunkeld for the XJ40 30th Anniversary event. 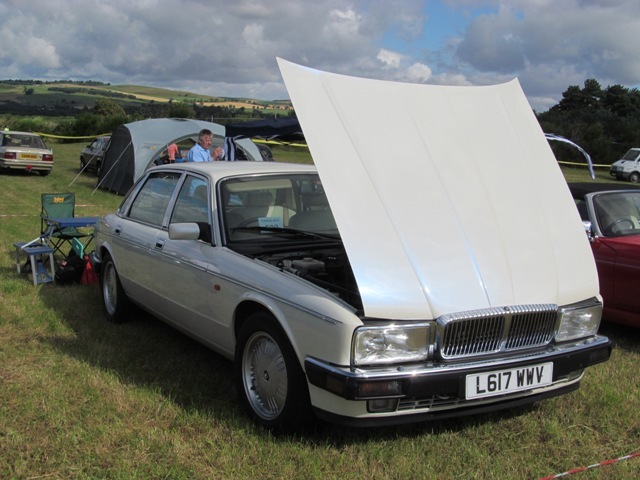 More pictures of this XJ40 can be seen on the Xclusively Jaguar Facebook page. In addition to enjoying all the racing, and the excitement and atmosphere associated with that, the highlights for me were taking part in the ‘Jaguar F-type Drifting Experience’ where Rob and I actually had the opportunity to go out in an XE which we felt was more exciting than the F-type, and being invited by the JDC to take part in the JDC 60th anniversary parade, where we completed two very memorable laps around Silverstone circuit in our black X358 XJR. All in all, a fabulous experience this year, and the rain held off for the entire event! More pictures of Silverstone Classic 2016 on the Xclusively Jaguar Facebook page. 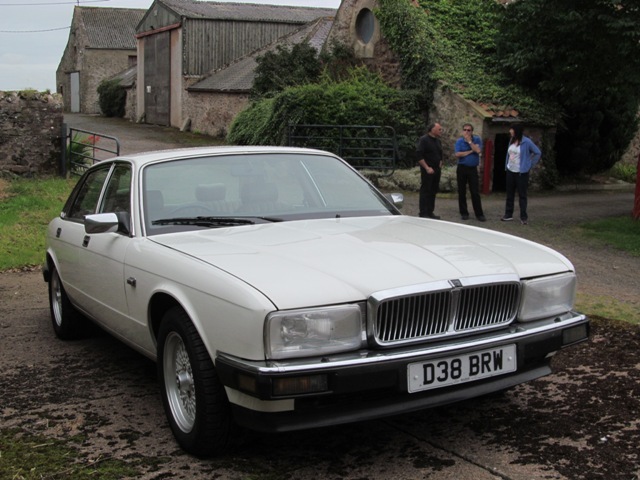 Our newly acquired Daimler Majestic Insignia had its first outing and received a lot of attention on the JEC Edinburgh stand, parked alongside fellow members cars, which included a Series 1 XJ6L, Series 3 4.2, XJ-S Convertible, XJS Celbration Coupe and a Daimler V8 250. As this post goes online we are preparing two rather special XJ40’s for Dunkeld, which I will report on in the October 2016 issue of Xclusively Jaguar News. On his way to Dunkeld, David Marks stopped for an overnight break with us, so I took some pictures of his Prototype XJ40 which featured in a complete series in the JEC magazine some years ago – not often you have a Prototype XJ40 on your driveway!